As I mentioned in the last post, Brett felt bad that his birthday present for me has yet to arrive. So he decided to surprise me by taking me on a quick jaunt to Vancouver for the day to do some fabric shopping! Unfortunately our time in Vancouver was cut short due to the fact that the ferry trip there was delayed because of a power outage. I'm just glad that we had a vehicle and didn't have to wait inside the ferry terminal. Although, having to use a pubic washroom in the dark is quite the interesting time. 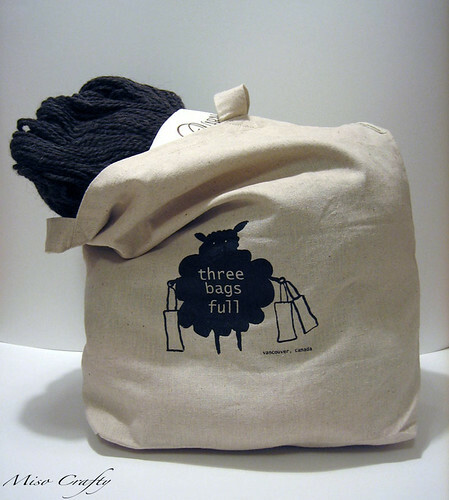 Anyhoo, I have been gushing for weeks now about how I want to go to the store Three Bags Full on Main Street. Some of the girls from my knit night have raved about it and I've heard so much about it from other knitters too. On the way to the downtown core we managed to make the stop. I was finally going to Three Bags Full!! And the shop did not disappoint. 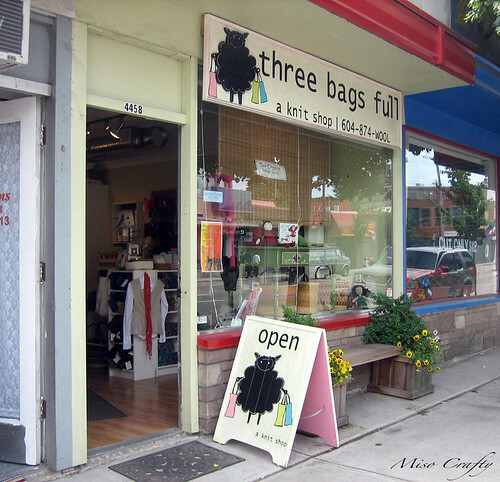 Not only was it really cute from the outside, the inside was chalk full of gorgeous yarn in shades of the rainbow, and the staff was super friendly and helpful. I bought some yarn, but didn't take any photos. Mainly cause it's way too dark in my house right now and the photo just won't come out right. 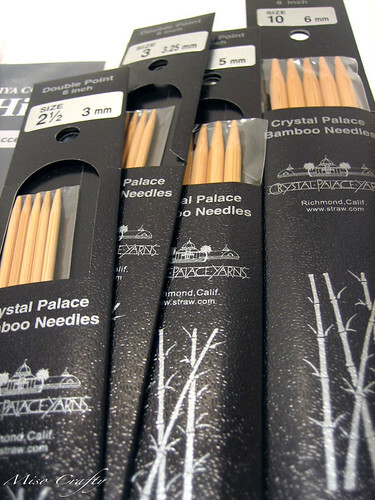 I also got some DPNs that I've been looking for but couldn't find in bamboo, and some circular needles in sizes that I couldn't find here in Victoria (I've been waiting forever for the Beehive to call to say they recieved some, it's been months so far). I decided to try out the Addi needles, since so many girls from my knitting group have raved about them. I also bought some HiyaHiyas, which I have heard of but never tried out either. I got them in the sizes that I know I won't be using that much, and the Addis in ones that I know I'll use a ton. I also got some über cute buttons. Anyone who knows me knows that I love buttons. I'm obsessed with them. When I was in school all my projects featured a giant button. It was almost like my signature, a trademark if you will. 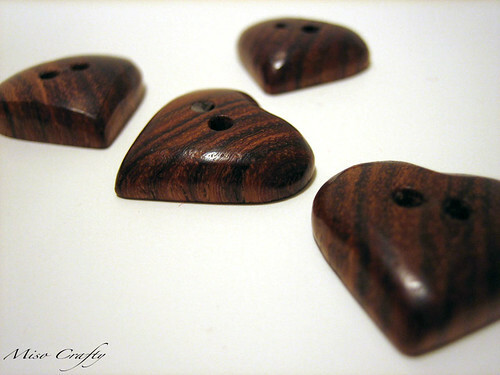 So when I saw these wooden hearts, I knew I had to make them mine! The only thing is, I don't know if I can use them!! The project would have to be mighty special in order for me to use these on it. Too cute for words!! When they gave me the bag they even offered me the use of their fabric color markers to color in the shopping bags the little lamb is carrying! Unfortunately Brett and the little one were waiting in (a very warm) car for me. So I had to decline. But next time I'm definitely going to take them up on their offer! I can't wait to go back! If you are in, or planning on visiting Vancouver, check out the shop!